BUK9212-55B Trenchmos (tm) Logic level FET N-channel enhancement mode field-effect Power Transistor in a plastic package using Philips High-Performance Automotive (HPA) TrenchMOSTM technology. This is one package pinout of BUK9212,If you need more pinouts please download BUK9212's pdf datasheet. 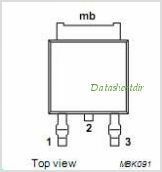 This is one application circuit of BUK9212,If you need more circuits,please download BUK9212's pdf datasheet.